Did Vote Leave break spending limits? We need to know. [The images above are of the BeLeave and apparently unrelated VoteLeave logos. Fair use exception applies]. Should you have endless money to spend you can capture our democracy. To protect it from capture we have legal spending limits. Those spending limits apply to your spending in general elections and they apply to your spending in referendums. And to ensure those spending limits are effective the law stops you channeling excess spending through puppet entities. Does the organisation share a "plan or other arrangement" with another entity to obtain a particular outcome? That is the question the law asks to determine whether an entity is a puppet entity - and it is a broad test. If you have a puppet entity, its spending counts as yours. And if you don't report it as yours you commit a criminal offence. The law also establishes a body - the Electoral Commission - to police those legal spending limits and to protect our democracy. When it doesn't do its job our democracy can't function: those who seek to abide by the law will inevitably be outspent by those who are indifferent to whether they comply with the law. Did the Electoral Commission do its job during the referendum? Was the Electoral Commission watchdog or asleep on the job? Here are some facts - and they are not in dispute. (7) Vote Leave spent 40 per cent of Vote Leave’s £6.8 million budget with Aggregate IQ. 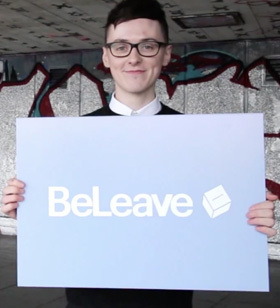 (11) as you can see from the image Vote Leave and Darren Grimes also used the same logo. Nevertheless, the Electoral Commission decided that there were not even reasonable grounds to suspect that Vote Leave and Darren Grimes were working together. We think this is bananas; we think it's laughable; we think it brings the Electoral Commission into disrepute; and we think it undermines our democracy. We want to force the Electoral Commission to do what it's there for and what it promised to do before the referendum to ensure "integrity... of... campaign... spending." We want to force it to reopen its investigation. We think if it does it can only properly conclude that Vote Leave has committed a criminal offence. We have assembled a high class team. It will be led by Jessica Simor QC of Matrix Chambers; she will be supported by Tom Cleaver of Blackstone Chambers. They will be instructed by Polly Glynn of Deighton Pierce Glynn. We believe our prospects of succeeding in the judicial review are very good. If you care about our democracy, we invite you to participate in funding what we hope will be a landmark case to protect it. We invite you to read our letter to the Electoral Commission here. That letter is the first formal step in the legal process and, if we raise the money, we should be in a position to issue proceedings in the High Court against the Electoral Commission in around a fortnight. I understand our prospects of succeeding to be very good. However, of course, there can be no certainty about the outcome. A judicial review action takes place in two stages. First, you need permission from the Court. We are seeking to raise £35,000 to take the case to the permission stage. If we get permission we will then need to prepare for the full hearing. If we hit the first £40,000 target we will seek to raise £40,000 for the next stage - the so-called 'stretch target'. We are seeking to raise 106% of this sum to cover our direct costs to CrowdJustice for this fundraising. We anticipate that these sums will be sufficient to take the case to a conclusion in the High Court. There are, however, circumstances in which we may need to ask for more: in particular if the case changes in nature into a much more fact heavy case than we presently anticipate or if we are unable to secure the protection that we presently anticipate against adverse costs. The legal team are working at very heavily discounted rates - and we anticipate that an element of their work will be entirely free. We anticipate that we will obtain permission. However, if we are wrong, any surplus money raised will be held for other litigation with similar ends: it will not go into the general funds of the Good Law Project. There are no circumstances in which any monies raised will go to Jo Maugham QC personally and neither he nor Good Law Project will make any charge against these monies in connection with this litigation - not even for direct expenses. Wishing you every success. Keep on fighting! You may remember that the Electoral Commission was eventually granted permission to appeal to the Court of Appeal the decision of the High Court in our favour. To resist that appeal - and to keep closed the enormous loophole in our spending rules that the Electoral Commission, inexplicably, insists exists - we need to raise money to cover our legal costs in the Court of Appeal. You can read about that crowdfunding here https://www.crowdjustice.com/case/our-democracy-isnt-for-sale/. If you were able to spare a further sum to help protect our democracy from the influence of wealthy donors we would be hugely grateful. We can update you on two matters. First, despite having been refused permission to appeal by the High Court (comprised of two judges, both now sitting in the Court of Appeal), the Electoral Commission has asked the Court of Appeal for permission to appeal. We will update you further on this front when we hear from the Court of Appeal. Second, costs. As matters stand, we have received as the successful litigant a £40,000 contribution to our costs from the Electoral Commission and we crowdfunded (net of Crowdjustice's costs and rounding to the nearest £100, £64,500). If we assume that the Electoral Commission does not get permission to appeal, we will have spent (including VAT) £29,400 on the fees of Deighton Pierce Glynn, £900 on the disbursements of DPG, £14,400 on the fees of Tom Cleaver, £70,300 on the fees of Jessica Simor QC, and £2,400 on the fees of Eleanor Mitchell. As you will see, this leaves a deficit of £12,900 which will be funded from the modest general resources of Good Law Project. In the event that the Electoral Commission's appeal proceeds and is successful the aggregate fees payable will be reduced by £40,000 but the Good Law Project's deficit will remain the same. The solicitors and Counsel worked extremely hard to achieve the successful outcome we enjoyed and I am hugely grateful for their efforts. But, although I agreed to these fees, some of them are too high for public interest litigation and I should not have agreed to them. I was unable to secure a reduction. Going forward I will try not to repeat my error. For my part, although I have recouped direct expenses from Good Law Project funds, I have not charged a fee for my services on this or any other litigation or for services not directly connected with litigation. As you may have seen on the news, the High Court ruled that the Electoral Commission had misunderstood the law surrounding donations during the EU Referendum. The High Court’s ruling is scathing, calling the Electoral Commission “unconstructive,” says it lacked “any rational basis,” was “arbitrary,” and its approach to the law is a “recipe for abuse of the spending restrictions.” Our director Jolyon Maugham QC, wrote a piece for The Guardian, which explains the implications of the ruling in further detail. However, the Electoral Commission has decided to appeal. You can read their application for permission here. Option A: We crowdfund to support the costs of defending our success. Please select only if you would contribute to that crowdfunding. Option B: We agree to participate in the appeal only if the Electoral Commission agree to meet our costs. There is a serious risk that this could mean we don’t appear in the appeal. There is also an in-between option where we only participate on certain terms as to costs. The underlying question seems to us to be about how we prioritise your resources and our energies. You have limited funds to support crowdfunding. We see many issues in society that we think public interest litigation can help with. What resource should we commit - and ask you to commit - to this case, where we have already succeeded? We have created a poll on our website. We ask whether you think Option A or Option B is the appropriate course of action. Please let us know what you think is best. I am pleased to say we now have a hearing date. The judicial review will be heard on the 19th of June. I will, as the written arguments are submitted for the hearing, add to this page to create a full record of the materials. You can read the decision of the Divisional Court giving us permission here. But it might also be worth me reviewing why the case is important. We started off with four arguments. (1) We said the Electoral Commission had at least enough evidence to investigate whether Vote Leave and BeLeave were spending from a single pool of money – they were ‘working together’ as the law has been inaccurately summarised – and if they were then Vote Leave had spent more than Parliament permitted it to spend with the result that the referendum was not run as Parliament intended. (2) We said, in fact, the Electoral Commission had enough evidence to conclude that Vote Leave and BeLeave were spending from a single pool of money so that Vote Leave had spent more than Parliament permitted it to spend with the result that the referendum was not run as Parliament intended. Pausing there, if you look through a ‘referendum’ lens at the work Carole Cadwalladr is doing and you ask how it is relevant, it is relevant because it shows the degree of cooperation between Vote Leave and BeLEave. (3) We also said that even if Vote Leave and BeLeave were not spending together a single pool of money, if Vote Leave donated its money or services of Aggregate IQ it had commissioned to BeLeave that money or the cost of those services would count towards Vote Leave’s spending cap. If we are right, the inevitable result will be that Vote Leave spent more than Parliament permitted it to spend. (4) Finally we said that the Electoral Commission permitted this to happen and so it had failed to ensure the referendum was fair. The Electoral Commission, before we sued them, told us that there was nothing wrong with its investigation. We sued them anyway – and the day before they had to file their response to our claim they agreed to reopen their investigation. This meant that we got what we were asking for on the first of our points above and in relation to the second there was no longer a need for the Court to decide it because the investigation was open anyway. In the hearing before the Divisional Court we were asked what we wanted it to do in relation to the fourth point and we said we simply wanted the Divisional Court to decide that the Electoral Commission had not managed the referendum fairly. The Court was not persuaded that a statement about what the Electoral Commission had failed to do in the past was of legal value. But we may try again to persuade the Court on this at the full hearing. But in relation to our third point the Divisional Court agreed with us that there was an arguable case that the value of the donations made by Vote Leave to BeLeave counted as Vote Leave’s spending. It is this point that will occupy the High Court on 19 June. This, it hardly needs be said, is an incredibly important point. A high judicial authority – the Divisional Court – may decide that Vote Leave broke the rules set down by Parliament to ensure the Referendum was fair. There are many MPs who believe that Brexit is not in the national interest but who feel shackled by the ‘will of the people’ narrative. Those MPs will find those shackles unlocked if a court says that Vote Leave broke the rules laid down by Parliament. They will know, because a court has said so, that the Referendum was not run as Parliament intended. The Electoral Commission reopened its investigation. What next? Our judicial review of the Electoral Commission’s failure, as we see it, properly to investigate Vote Leave’s spending in the EU Referendum (you can see the claim form here) had two elements. First, we said that its investigation into the facts was flawed (our “First point”). And, second, we said that it had misunderstood the law (our “Second point”). The First point looks at the events surrounding the EU Referendum. The Second point has important policy implications going forward: without an answer campaigning bodies in future referendums or elections will not know whether they can multiply their spending power by giving money or services to like minded campaigns. The Electoral Commission’s original stance was that we were wrong on both points: they had carried out a proper investigation and they had correctly applied the law. But, when we sued them in the High Court, they agreed to reopen their investigation into Vote Leave. In other words, they agreed our First point was right. In light of their concession, they invited us to drop the case. But we believed it was important to get clarity for the future and so we decided to continue with the Second Point. Earlier this week we heard from the High Court. To bring a judicial review claim you need permission. There is a two stage process for deciding whether you should have permission. The court can give you permission after having read the papers. Or, if it is not satisfied having read the papers that you should have permission, you can (generally) ask for an oral permission hearing. Here is what the High Court said: PermissionDecision. (3) because the Electoral Commission agreed to reopen its investigation the High Court says the Second point, advanced in this case, is academic and so it has refused us permission on the papers. But it has indicated that we may make a new claim. Whatever the merits of what the High Court says at (3) – and we can see arguments both for and against its approach – for us to abandon the case would leave the law in a very unfortunate state. Neither the Electoral Commission nor campaigners in future referendums and elections would know what they can do with their money. We think it would be in the interests of both the Electoral Commission – which after all has to regulate elections and referendums – and campaigners to know what the law is. So we have written to the Electoral Commission making proposals about how the issue might be resolved – either by them agreeing to issue new guidance which we might challenge in a new case or by them agreeing that it is in the public interest that the High Court resolve the issue in this case. You can read the letter here: Letter-to-Electoral-Commission. What follows is the text of a Press Release issued last week. Earlier this afternoon we received a response from the Electoral Commission to our letter threatening judicial review proceedings. You can read that letter here. The Electoral Commission has refused to reopen its investigation into what we say is overspending by Vote Leave in the Referendum. In the circumstances we will be issuing judicial review proceedings by, my legal advisers tell me, no later than Thursday of next week. We continue to believe that the Electoral Commission has simply misunderstood the law. We continue to be staggered at how the Electoral Commission can look at all the facts that are admitted and form the view there are no reasonable grounds even to suspect that Vote Leave and Darren Grimes were acting together. But I am very pleased that we will now - thanks to those who supported the Good Law Project's Crowdfunding - have the opportunity to interrogate the Electoral Commission's position before a High Court Judge. Please continue to watch and support.